Netflix’s decision to remove some seasons of Futurama came as a blow to members of a subreddit called r/Futurama_sleepers, a community of thousands of people who use the show as sleep-inducing white noise. “For the last decade or so, I’ve gotten into the habit of falling asleep watching Futurama,” Jason Koebler writes. You know the anxiety that wakes you up in a dark pool of your failings? The uncertainty in which you live? This technique helps: You switch on Netflix. You choose a show you’ve already seen. You know the ending. You can rest. Dear Futurama_sleepers, you have options! As a Netflix denizen and lifelong insomniac, I’ve snared sleep using Fawlty Towers, Arrested Development, Golden Girls, The Office, Seinfeld, A Bit of Frye and Laurie, That Mitchell and Webb Look, and a long-running favorite: Peep Show. 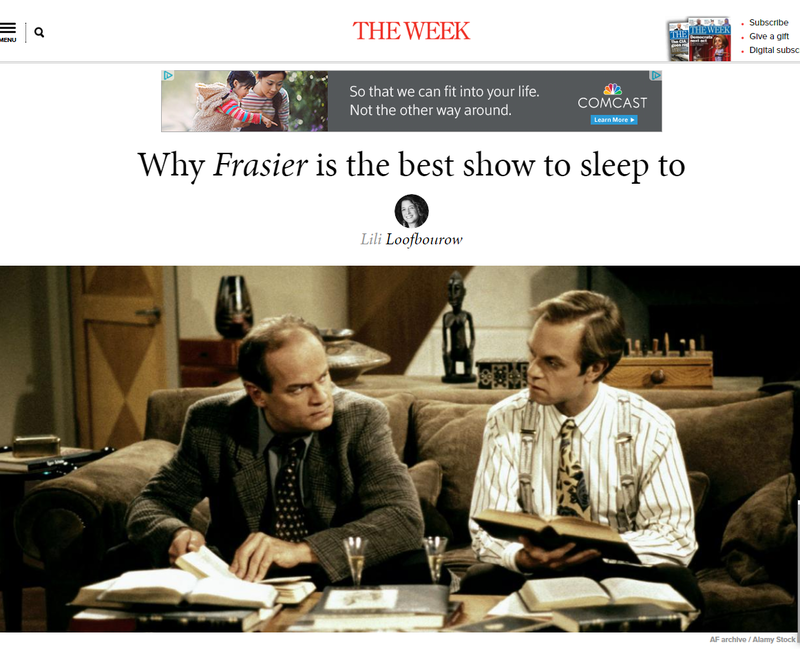 But the clear winner — when it comes to Sleep TV — is Frasier. 2. There’s a musicality to Niles and Frasier’s banter, and Kelsey Grammer’s voice is even more soothing than Stephen Fry’s. I have tested this: I have a Jeeves and Wooster clock that has a button you can push to make Stephen Fry’s voice hypnotize you asleep. 3. Most importantly, though: That inky swamp of panic you live in? Banished. Frasier and Niles spar in a limpid, well-off pool. Their neuroses are gentle and plush: “You never fold cashmere, you’ll misdirect the nap!” They accept themselves utterly, even when they know they’re being ridiculous. Frasier’s greatest enemy? Cam Winston, a version of him who lives one floor above him.